Using a pulsed laser beam from aboard its recently launched Lunar and Atmospheric Dust Environment Explorer (LADEE), NASA has transmitted data over the 239,000 miles between the Moon and Earth at a record-breaking download rate of 622 megabits per second. Say goodbye to the glacial transmission speeds of RF communication! Above: An artist's conception of LADEE using lasers to communicate with Earth // via NASA. 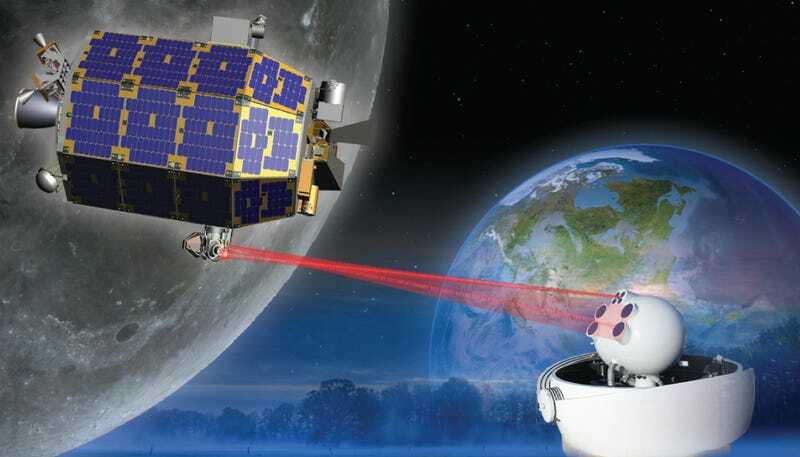 The demonstration, which NASA calls its Lunar Laser Communication Demonstration (LLCD) will usher in "the next generation of space communication capability," according to Badri Younes, NASA's deputy associate administrator for space communications and navigation (SCaN). "We are encouraged by the results of the demonstration to this point, and we are confident we are on the right path to introduce this new capability into operational service soon." The connection would be a dramatic and long-awaited improvement over the radio frequency communication that NASA has relied on for decades – a technology Agency officials say has reached its practical limits in light of more data-intensive technologies, including increased image resolution and 3D-video transmission. Also, cat videos. NASA's announcement makes no mention of the challenges faced by communication with translunar space – i.e., that volume of space beyond the Moon's orbit. Communication with planets and spaceships in deep space will likely involve communication relays and protocols that can accommodate for vast distances, extended communication times, and lots of interrupted signals – none of which are of significant concern to spacecraft as near as the Moon.